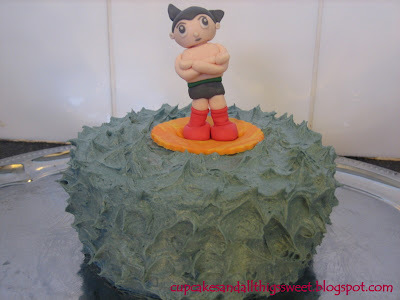 I searched the net looking for Astro Boy birthday cakes for inspiration and there wasn't that many! 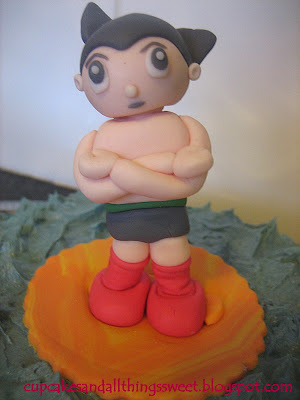 I was surprised about that, so here is my contribution to the world of Astro Boy cakes. This is the cake I made for my husband's birthday last week. He's all sugar...paste that is. It was all to much for poor Astro in the end, he had to lie down. His eyes were the worst part to make. Next time i'll make indents into his head and stick the eyes in instead of having googly bulging eyes. Nice legs! 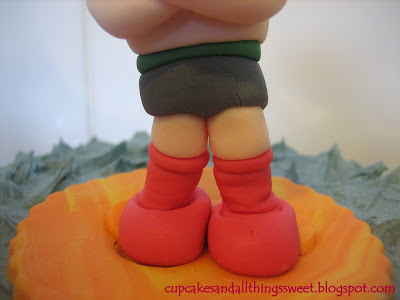 I stuck toothpicks in his legs as an after thought which made his legs go all funny and his boots now look like socks. 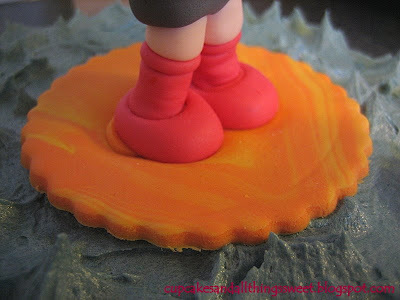 He is supposed to be standing on yellow and orange flame colours and the icing is supposed to be that really nice deep blue that you can see in the pic below but I just couldn't get the icing to go that colour. The colour schemes came from this pic. Another picture i used to help me. I took some notes when I was making Astro to help me next time so here they are, they might help you too. 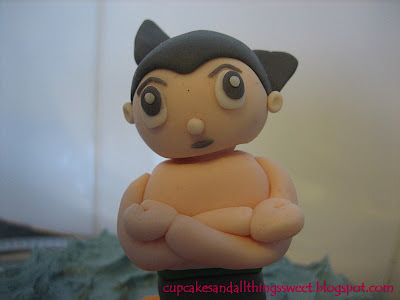 Astro was made with Sugarpaste(fondant) which I bought at my local food shop. Black for his pants, eyes and hair. Red Shoe/foot: 3 grams each. Make into a bit of a cone shape and push end of bush into the smaller end to indent for red boot. For Astro's hair: They are just sharp triangles stuck to his head but I started off making them into shark fins and then tweeking them. I just found that to be the easiest for me. 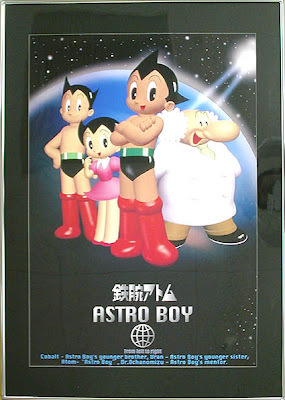 Astro stood approx. 8.5cm tall. I can't believe you made that! It boggles my mind! 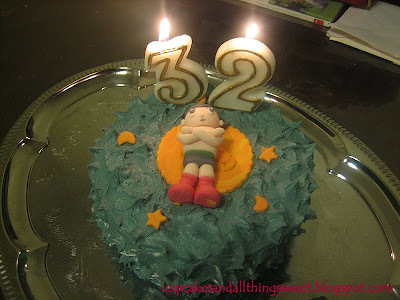 That is one creative cake! oh he is so cute!! I am sure there are lots of boys (men) in the 30ish age group who would be happy with this!! Wow ur model looks amazing. And the way u xplained it too good. I think he looks great...will he be offended that I don't know who he is? The Blonde Duck: haha, I can't believe I made it either! Maria: I agree it's not bad for a last minute throw together icing job. This Girl Loves To Talk: Oh yes! Premyscakes: I'm glad you like it. 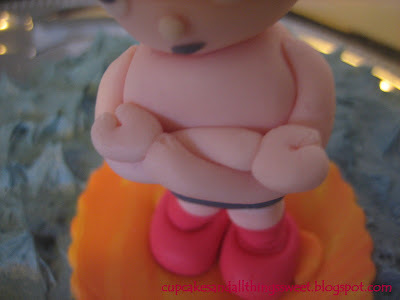 It means heaps coming from a fellow sugar crafter. You are a special person like your mum but now she can learn from you with your cake making skills. No.1mum: I think that's because i got my skills from you! We should get together and bake an amazing cake. 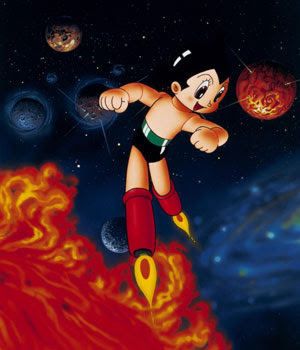 Astro Boy really an world wide Icon. Kids would surely love this.